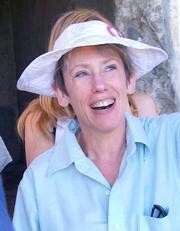 Barbara Burrell is a Roman archaeologist who has dug at sites across the Mediterranean, including Spain, Italy, Greece, Turkey, and Israel. It may have been this diversity that has led to her being chosen as editor of the forthcoming Blackwell's Companion to the Archaeology of the Roman Empire. She is also in the midst of writing and co-editing the two-volume final report of her excavation of the Promontory Palace at Caesarea Maritima in Israel, and publishing the coins found at Mount Lykaion in Arcadia, Greece. Beyond fieldwork, her interests include reception and interpretation of the ancient city in the Roman empire, and Roman provincial coins, architecture, and art. (PI) Burrell, Barbara, A Companion to the Archaeology of the Roman Empire, UC's University Research Council. (URC Mid- and Late-Career Faculty Research Program Awards AY2014-15); $12,000.00. 05/01/2015 to 04/30/2016. Status: Active. (PI) Burrell, Barbara, INSTAP 2016 Tytus Fellow - Ioannis Galanakis, Institute for Aegean Prehistory. (2016TytusFellow); $7,500.00. 04/01/2016 to 08/31/2016. Status: Awarded.